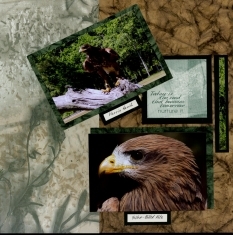 All of the layouts for the Birds of Prey Scrapbook use the October 2009 Scrapbook Kits (Senior and Junior) from Club Scrap called Natural Resources. 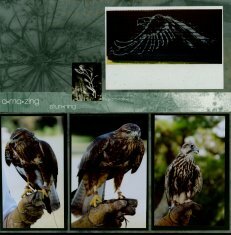 Most of these beautiful Birds Scrapbook Layouts were done using Club Scrap's Assembly Line ScrapBook Layouts - ALSB. 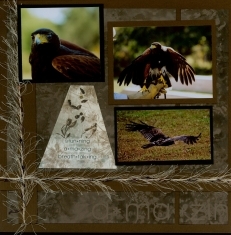 These Assembly Line Scrapbooking layouts come free when you purchase the kits. I completed all of the Assembly Line Scrapbook Layouts just after my kits arrived in early and mid-October. 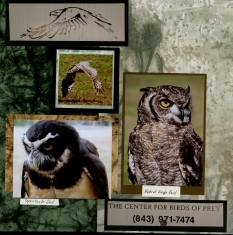 Then, shortly after I had finished them, I received an email from The Center for the Birds of Prey in Awendaw, South Carolina announcing a Nature Walk hosted by naturalist Rudy Manke. 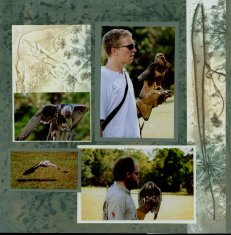 Mr. Manke is the director of Nature programming for SCETV Network and has been on SCETV programs since 1978 - many of which I have watched. 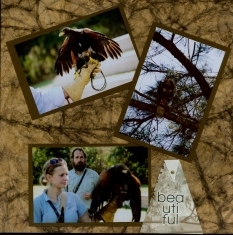 I immediately signed up to go on the nature walk and attend the Birds of Prey flight demonstration later in the day. 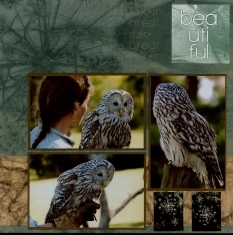 Both were awesome and when I got my photos back from Kodak yesterday, all my Birds Scrapbook Layouts were ready to be completed by just adding the photos and my scrapbooking of the day is completed. 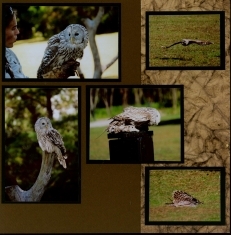 The 4 large photos on these two layouts above were items I purchase at the Center. The rest of the photos are mine. 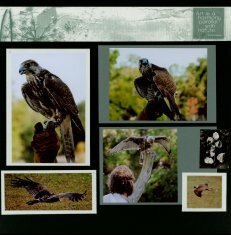 I had my photos developed through the Kodak Gallery and in their newly available KODAK Professional Metallic Glossy Finish. 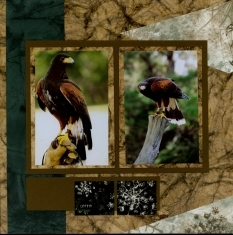 The photos are stunning, almost 3-dimensional, and have exceptional sharpness, a pearlescent finish, and a very distinctive metallic look for my Birds Scrapbook Layouts. 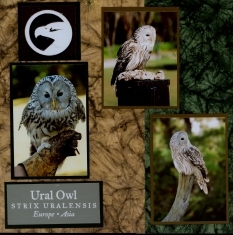 The photo of the sign which shows the name of the Ural Owl was a gray wooden sign. The developing with the Kodak Professional Metallic actually made the wooden sign appear as shiny and metallic - like stainless steel. 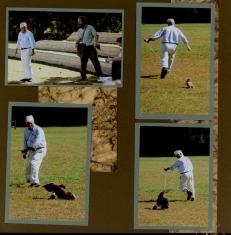 I just wish the beauty of these photos could show through the web-site, but it is truly awesome. 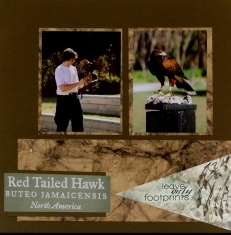 These next layouts of the Birds of Prey feature the Red Tailed Hawk. 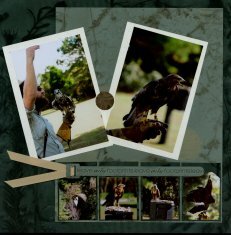 The layouts feature triangular shaped cut outs and Distressed Brown and Green hand made papers. 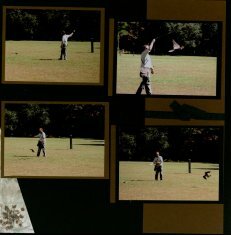 This layout on the left shows Mr. Manke running with a "rabbit decoy" for The Center for the Birds of Prey Red-Tailed Hawk to demonstrate the method of attacking. 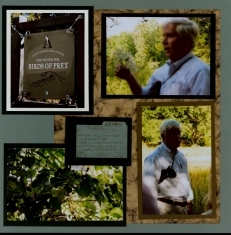 On the right are photos taken during the Nature Walk as well as notes on the new items I learned about which are tucked inside the tiny file folder in the center of the layout. 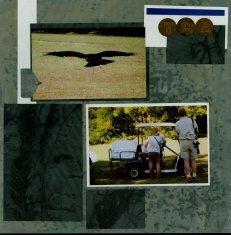 The file folder was one of the embellishments provided in the Club Scrap kit. 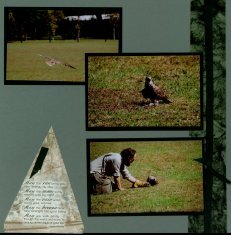 These next layouts shows a Falcon from the Birds of Prey Flight demonstration and it's tremendous speed in attacking prey that is in flight. 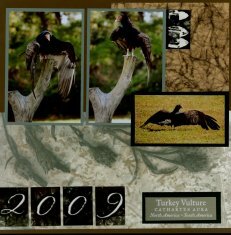 These next layouts show the Turkey Vulture in a "Mantaling" position to make itself appear larger and as it travels along the ground. 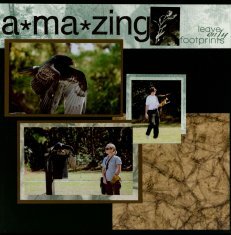 The word "Amazing" was stenciled using the stencil from the Club Scrap kit as was the word "Breathdaking on the pages with the Owls. 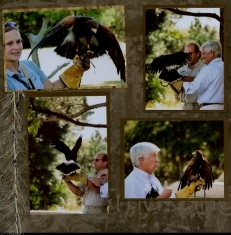 These last two layouts were just some more "in flight photos" from The Birds of Prey Flight Demonstration. The Eagle shown flying high against the sky was not a planned part of the demonstration, but an unexpected "Guest Appearance" that did make some of the smaller birds a little nervous. I have been a member of Club Scrap since 2002 and I absolutely adore their monthly kits. I have been using their assembly line layouts ever since they first started making them available. It allows me to scrap whether I have time to do only a little or a lot of layouts, but I a can produce more layouts quicker than I used to because a lot of the creativity has already been done for me. Not all of the layouts I put together from the Assembly Line are immediately usable. Sometimes they need to be turned on side or have a photo matte moved from horizontal to vertical position, so when I initially do them without photos, I will use only a little bit of adhesive so later I can gently pick up the items that I want and move them to accommodate my photos or other embellishments. 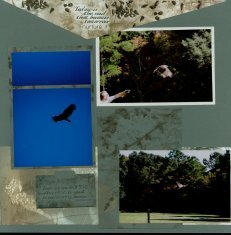 I have another scrapbook that I did that was all Assembly Line, so check that out at the Alaska Scrapbook. 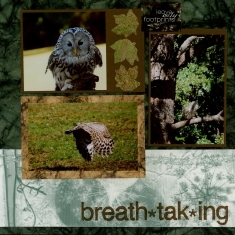 Over 70 Themed & Heritage Scrapbooking Albums for more layout ideas. 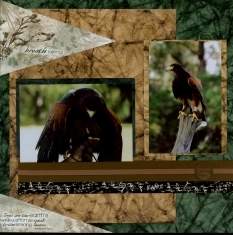 Home Page for Scrapbook Advice from the Birds of Prey Scrapbook.